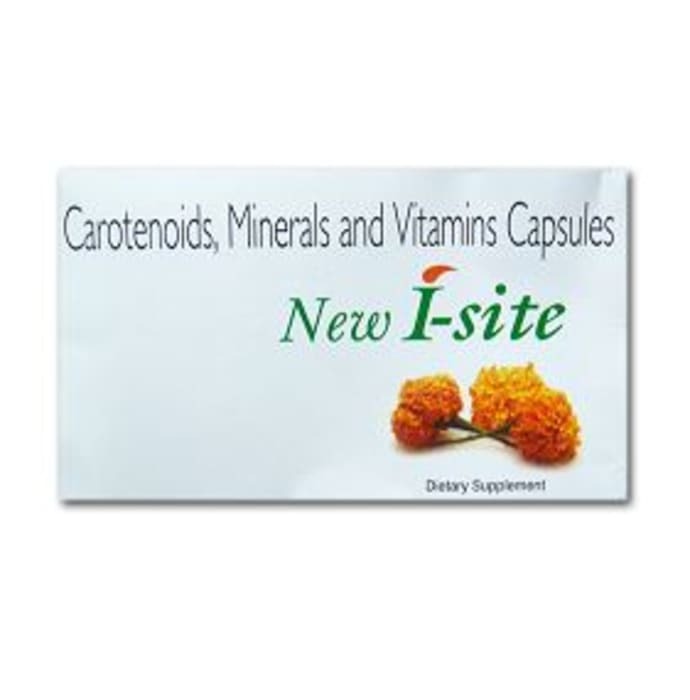 New I-Site Capsule contains Lutein, Zeaxanthin Beta-carotene, Copper, Manganese, Selenium, Zinc, L-Glutamic acid, Lutein, Vitamin C and Vitamin E.
Vitamin C and Vitamin E is a powerful antioxidant, is associated with reduced risk of cataracts. New I-Site Capsule demonstrates the essential role of in preventing risk of Age-related Macular Degeneration and many other eye conditions like Cataract, Retinitis Pigmentosa (genetic disorders that affect the retina's ability to respond to light), Dry Eye and Glaucoma. A licensed pharmacy from your nearest location will deliver New I-Site Capsule. Once the pharmacy accepts your order, the details of the pharmacy will be shared with you. Acceptance of your order is based on the validity of your prescription and the availability of this medicine.